Here’s what’s up in the world of TV for Friday, September 30 and Saturday, October 1. All times are Eastern. 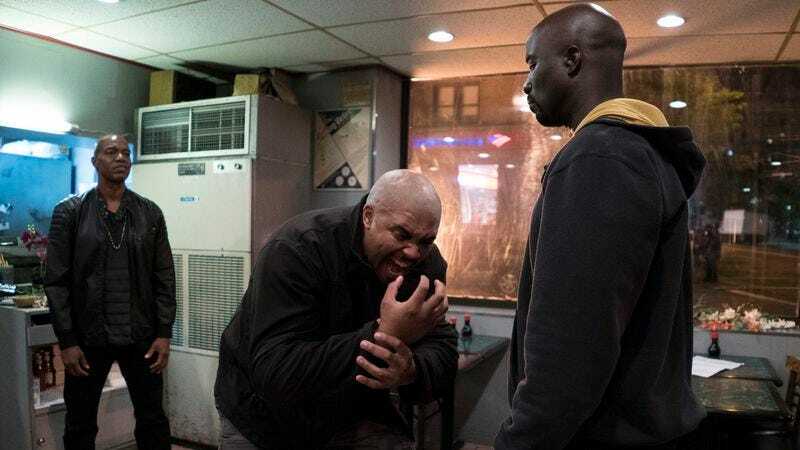 Luke Cage (Netflix, 3:01 a.m., Friday): Mike Colter gets his own Marvel Comics TV franchise as his titular indestructible, unjustly convicted ex-con spins off from his supporting role on Jessica Jones and becomes an inner-city “hero for hire.” In keeping with Netflix’s gritty, mid-budget superhero ethos, look for Luke to tackle fewer city-stomping alien invasion fleets and more (or less) human baddies like Mahershala Ali’s Cottonmouth and Erik LaRay Harvey’s Diamondback. Also look for the most-welcome entry of kickass super-cop Misty Knight (Simone Missick) into the Marvel TVU, as well as, no doubt, appearances by Cage’s sometime-superhero sometime-lover Jessica Jones, crossing over from her own show and keeping things complicated. The stellar supporting cast also includes Alfre Woodard, Frankie Faison, Theo Rossi, and Frank Whaley, all of whom join us in wondering how a bulletproof superhero with non-bulletproof clothes can survive without Tony Stark money. The A.V. Club’s going all in on coverage, with Joshua Alston raving about the show in his pre-air review, Caroline Siede’s binge-watch reviews smashing things up all weekend, and Ali Barthwell handling the full episodic reviews. The Crooked Man (Syfy, 9 p.m., Saturday): In this Syfy original movie, a lopsided monster squares off against Michael Jai White. Good luck, Crooked Man. Even kung fu treachery can’t save you. America Divided (Epix, 9 p.m., Friday): Executive producer odd-trio Shonda Rimes, Norman Lear, and Common enlist some other celebrity types to present episodes of this documentary series that examines various types of inequality and injustice in the United States. Look for concerned famous people like Amy Poehler, America Ferrera, Jesse Williams, Peter Sarsgaard, Zach Galifianakis, Common, and Lear to host. Doomsday: 10 Ways The World Will End (History, 10 p.m., Friday): A new, super-cheery documentary series about how we might all get wiped out, with the fires, and the floods, and the meteors, and the bees, and the dogs with the bees in their mouths so when they bark they shoot bees at you. Plus a Trump presidency, which will bring about at least six of those. Austin City Limits (PBS, 9 p.m., Saturday): Paul Simon opens the 42nd season of this music series, meaning he would have been promoting Still Crazy After All These Years if this were the pilot. Saturday Night Live (NBC, 11:29 p.m., Saturday): After an off-season of surprising cast exits (Taran Killam, Jay Pharoah), cast exits (Jon Rudnitsky), immediately controversial cast hires (Melissa Villaseñor), and cast hires (Mikey Day, Alex Moffat), SNL returns, with Suicide Squad and The Big Short actor Margot Robbie hosting. The Weeknd’s the musical guest, Dennis Perkins is your reviewer, and someone at SNL is undoubtedly working very hard on a Jared Leto-as-Joker impression. Black Dynamite (Hulu): While Luke Cage will apparently and understandably distance itself from the comic character’s sometimes tone-deaf blaxploitation roots (promo pics show no evidence of open yellow disco shirts or metal tiaras), this animated series steers right into the camp. The continuing adventures of Michael Jai White’s invincible martial arts hero from the cult classic comedy, the series’ Black Dynamite still manages to sneak in some social commentary while beating the crap out of baddies (like nemesis Richard Nixon) and meeting up with figures such as Michael Jackson, Richard Pryor, Bill Cosby, and, um, Black Jaws.